last week i witnessed probably one of the top 5 ironic events of my life. at the end of some pointless training chemical safety training course (in theoretical physics, spilling hot tea on yourself is about as dangerous as it gets), a gaggle of geography students wandered into the lecture hall looking for a room that was in annother building halfway accross campus. that's correct, a group of lost geographers. it seems like the one and only binding requirement of you in that field is knowing where things are. This wednesday marks the first annual Kneecap Day! One-year anniversary of me dislocating my patella, and thenceforth irrevocably altering the course of my life (I would suppose). I like the idea of making up personal holidays, so I suppose I am going to try commemmorating it somehow. Amusingly enough, blowing up my knee seems like something I'm well-known for somehow. A few months ago I ran across this blog post on the unofficial dartmouth physics-astro blog. Not to mention the worldwide circulation of this photo, adroitly snapped by Jenn as I returned home from the ER hopped up on goofballs, and, for some reason I don't understand, sent to absolutely everyone by my father. 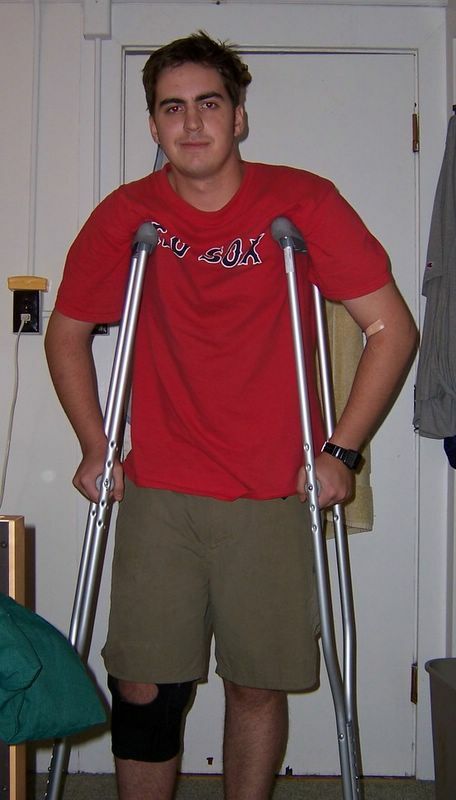 My working theory is that he was proud that I was enough of a jock (at least temporarily) to injure myself badly enough to need crutches. The best part was visiting my grandmother at x-mas and seeing it on her fridge! In any case, I am especially wondering this: what is the correct observance of a orthopedic injury? I was thinking--hit of morphine and then crumpling over for no good reason--just like last year. 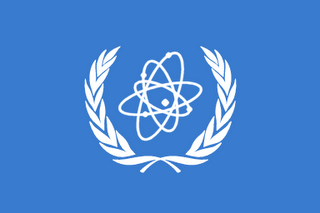 i have just learned that this is the symbol of the international atomic energy commission. it is the coolest flag i have ever seen, and, i suspect, the one that physicists will use when they take over the world. 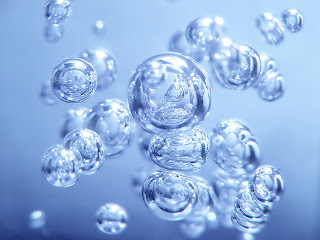 in quantum field theory, in the process of making calculations, there often arise situations where you can only deal with the energy difference between two states, and you ignore what an "abosolute" energy would be. in the context of understanding the Lagrangian you are working on, this doesn't cause any difficulties, but overall that supposedly meaningless absolute energy eventually becomes offset, so to speak, by the accumulation of these energy differences. it turns out that you can actually find out what all these offsets are and add them up to see the individual energy terms of every particle interaction. most of these are are "vacuum energy" terms which come into consideration only in certain situations, such as the cosmological constant problem as a potential source of missing energy (though it's too small). well, a physicist with a sense of humor went through the trouble of finding this abomination, and making it into a pdf. in fact, he even proposes an exam question based on it! brilliant! i think i've woken up in a cold sweat with visions of this page in front of me. i especially like the "known physical data since 1860" part. not to mention the part about excluding gravity--since that would just be too much to ask! looking through the many dusty and forgotten volumes scattered throughout my home i happened across this neglected text: applied soil physics, picked up as a joke from a table of free books once. it brought two questions to light -- questions that had been gnawing at me for years. 1. not that i condone it, but is there anyone lower on the physics totem pole than soil physicists? is there someone looking up at them with scorn, saying "curse those haughty bastards!" 2. do they really need the 'applied' in the title? are there numerous books on theoretical soil physics, and if so, can i read one?